It is the 41th year since the birth of the Van Cleef &Arpels “ballet” series antique jewelry,which were created by the great neoclassic ballet dance master-- George Balanchine,who was inspired by the dancing jewelry. With a total value of nearly 400 million RMB, the Ballet Précieux series jewelry has its first debut in China.The famous ballet Tan Yuanyuan was invited to renew George Balanchine’s dream for jewelry. 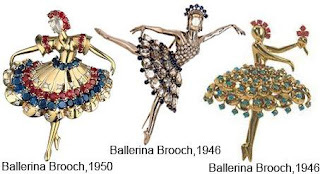 Van Cleef & Arpels created its first jewelry series, which is initially themed at dancing and whose mainly artworks are brooches.The styles of this series is to immitate various dancers’ elegant poses,including ballet dancers,opera dancers, Spanish dancers, small fairy maiden, even the dragonfly modelling female celestial. Their body is covered with shining platnium or polished platinum.The shadow of the dancer will become more glorious with the ruby in the waist or sapphire crown on the head setting as a foil. The diamond studded body is covered with gem-stoned dancing dress.Different gem stones, including rose or pear-shaped diamond,emerald or ruby with inclined cutting and sapphire with multiple cutting,etc.Finally,the expression of the dancers are outlined with rose cut diamond.It is worthwhile to own one for collection if you can afford or if you are a jewelry fan!